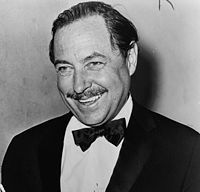 March 26, 1911: Thomas Lanier Williams III is born, better known as Tennessee Williams. He was a playwright with over 75 plays written. He won the Pulitzer Prize for Drama twice. The first time was for A Streetcar Named Desire in 1948 and again in 1955 for Cat On a Hot Tin Roof. He was also the recipient of the New York Drama Critics’ Circle Award twice and won one Tony for best play. Williams was born into a dysfunctional family and things went downhill from there. He was diagnosed with diphtheria at the age of seven and was nearly incapacitated for two years. His mother encouraged him to use his imagination rather than just drift through the time and at the age of thirteen, he was given a typewriter. His father was abusive and the abuse escalated as time went on. Williams’s sister, Rose, was schizophrenic and spent most of her adult life in mental institutions. In 1943, she underwent a frontal lobotomy that was unsuccessful, and she never truly recovered. Many of Williams’s characters are based on his sister. The stabilizing person in his life was his partner and secretary, Frank Merlo. The relationship began in 1947 and ended with Merlo’s death in 1961, throwing Williams into years of depression and alcoholism. Williams died in 1983, choking on a bottle cap being the official story. However, many people including his brother, Dakin, believe he was murdered. Police suspect drugs were implicated due to finding pills beneath his body. His plays offer us insight into his world. Also on this day, in 1934 the UK began testing drivers in order for them to become licensed.